Described in 1925 by the elite French publication Gazette du Bon Ton as “marvels of horology”, the Mystery clocks of Cartier, conceived by Louis Cartier and the maison’s clockmaker Maurice Couet after being inspired by the work of illusionist Jean Eugene Robert-Houdin, have come to represent a technical and aesthetic tour de force in the history of both Cartier and of the decorative arts. The first model came into being in 1912, and the maison continues to produce the mystery clock to this day. In 1973, Cartier acquired one of these marvellous clocks, a Portique Mystery clock, at an auction in Geneva. Inspired by a creation of their own from half a century ago, Cartier started putting together a fabulous selection of historic and exceptional pieces made by the maison and subsequently gave birth to what is now known as the Cartier Collection. Today, the Collection comprises more than 1,600 pieces of jewellery, watches, clocks, and precious objects, and gives the world’s most renowned museums the opportunity to celebrate Cartier creations by featuring them in major exhibitions. As an invitation to discover these masterpieces of watchmaking, the exhibition is currently being held at the 2018 SIHH. Their technical and stylistic excellence secures their place among the world’s most important works of art. Here are the highlights of the showcase. CM09A23 – Gold, platinum – rock crystal – rose-cut diamonds – coral cabochons – onyx – black enamel – square, 8-day double-barrel movement, gold-plated, 13 jewels, Swiss lever escapement, bimetallic balance, Breguet balance spring – transmission axle in rock-crystal crossbar masked by coral cabochon – Billiken figure removable to provide access to the movement – hand-setting and winding mechanism. 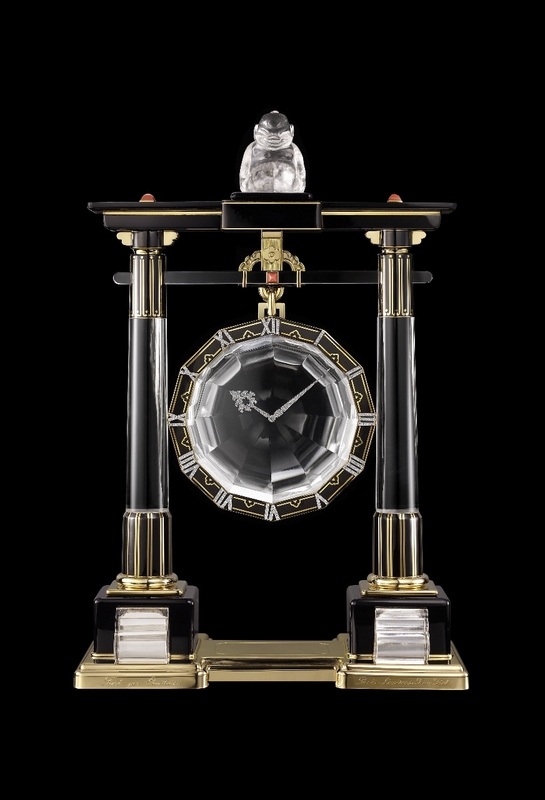 This clock was the first in a series of six in the form of a Shinto “shrine gate” (portique), all different and all made by Cartier between 1923 and 1925. It was sold to opera singer Ganna Walska, wife of Harold Fowler McCormick, heir to the McCormick farm machinery fortune. Like Daisy Fellowes and Mona Bismarck, Walska was one of the fashion icons of her day. With unerring taste, she assembled a remarkable collection of jewellery, showing a marked preference for Cartier. CM19A14 – Platinum, gold – white agate (base) – rock crystal – four sapphire cabochons – rose-cut diamonds – white enamel – rectangular 8-day movement, gold-plated, 13 jewels, Swiss lever escapement, bimetallic balance, Breguet balance spring Hand-setting and winding mechanism underneath the base. It was sold to Count Greffulhe, husband of the famous Countess Greffulhe, “the most beautiful woman in Europe” according to Marcel Proust, who partly modelled his character of the Duchess de Guermantes on her. CM 30 A21 – Gold, platinum – citrine – onyx (base and column) – rose-cut diamonds – white and black enamel – rectangular 8-day movement, gold-plated, 15 jewels, Swiss lever escapement, bimetallic balance, Breguet balance spring – hand-setting and winding mechanism underneath the base. It was purchased by Luz Bringas, a Mexican philanthropist, and then offered to José Yves Limantour, Mexican Finance Minister from 1893-1911, and member of the Académie des Sciences Morales et Politiques. CM 20 A28 – Platinum, gold – carved jade (elephant) – onyx (base and roof of pagoda) – rose-cut diamonds, pearls, coral, mother-of-pearl, crystal – black enamel – rectangular 8-day movement, gold-plated, 13 jewels, Swiss lever escapement, bimetallic balance, Breguet balance spring, set in a gilded metal case attached to the base of the pagoda and seated within the elephant’s back – hand-setting and winding mechanism accessed by lifting the pagoda to reach the movement. The jade elephant, of Chinese origin, dates back to the 18th century. This Mystery clock was the ninth in a series of 12 that featured animals or figurines, made between 1922 and 1931, partly inspired by Louis XV and Louis XVI clocks in which the clock was set on the back of an animal. Hans Nadelhoffer wrote of these clocks that, like the shrine-gate (Portique) series, “Although they lacked the symbolism of dynastic commissions associated with Fabergé’s Easter eggs, these figurative ‘mystery clocks’ enjoyed comparable prestige in Cartier’s production and are today considered the most valuable of all collectors’ items with the Cartier signature.” Today the Collection boasts four of these wonders including the Carp clock, the Chimera clock, this one and the Deity clock, the last in the series. It was once owned by the Maharaja of Nawanagar. CM12A26 – Platinum, gold – moonstone – crystal – rose-cut diamonds – white and black enamel – onyx for the base and semi-circular rings – rectangular 8-day movement, gold-plated, 13 rubies, Swiss lever escapement, bimetallic balance, Breguet balance spring – hand-setting and winding mechanism underneath the base. The transmission axle is masked by the onyx bead beneath the screen.